WARRANDYTE’s David Cameron was born in Zurich in 1951. Five years later a brand new FJ Holden drove off the GMH assembly line in Australia, and David and the classic motor vehicle were destined to come together for a lifelong partnership. The FJ eventually became David’s mum and dad’s family car and when he turned 18 his father presented him with the keys. What makes it really special is it was David’s first and last car. Now, almost half a century later, he’s still driving the classic around the hills of Warrandyte. David moved to Warrandyte with his parents Barbara and Don in 1962. “We moved to Glynn’s Road just after the great fire,” says David. After Grade 6 at the local primary school, David went to Norwood High School. “I completed my six year sentence at Norwood. It was a terrible time for me because I was so painfully shy. Life during those years was a bit of a misery. Later I played keyboard in a band called Pieces of Eight and that helped me with my shyness and gave me a passport into parties and social events,” he explains. David studied biological science at Latrobe University and it was during his second year when he met his wife Lee who was studying medicine at Melbourne Uni. David and Lee raised a family of six children, Marcel, 41, John, 37, Virgil, 35, Maria, 33, Felix, 31, and Angelica, 28. The family has grown up with the old FJ, too. “We’ve brought up our six kids and they have all been driven to school in the car, learned to drive in the car and some of the kids were even conceived in the car,” says David with a twinkle in his eye. “Unbelievably, the 1956 car’s odometer still reads in miles not kilometers. And when we add up all the miles we’ve done driving the kids to the Rudolf Steiner School, it adds up to more than the distance to the moon. Lee has kept up the family tradition and driven a 1954 FJ special since ’85. “My cars first engine lasted from 1956 until 1970,” David says. The first replacement-reconditioned engine lasted until ’88, the next replacement engine went until 2007 and David is confident the fourth engine will last until 2027. “Now I really look after the old girl and don’t push her too hard,” says David. As a botanist, David has ventured forth and driven his FJ on most of his field trips over the years, often taking Lee with him. Another time David and Lee were travelling through the South Australian Outback with a group of botanists. Lee was pregnant at the time and the corrugations on the outback roads were creating a rough ride. “We feared the constant bumps could have an adverse effect on the pregnancy and so we left the group and turned for home,” remembers David. “Nevertheless, it was a charmed and wonderful trip to make before we had a big family. Sometimes David and Lee have lived away from Warrandyte but like all good and committed Warrandytians they have gravitated back to where they belong. David, at 65, will keep working as a senior botanist with the Department of Environment, Land, Water and Planning and doesn’t intend retiring his trusty FJ Holden any time soon. It seems they will travel onwards together, for the whole journey. Perhaps the Angels Glue that has bound David and Lee’s marriage will also keep the old classic car on the road forever, all the way to the moon and back. THE drama of fire and rain featured in Chris Scott’s young life. She was born in Warrandyte in 1934, the year of the great flood, when the Yarra River overflowed its banks and spread as a single lake from Richmond to Warrandyte. The heavy rain throughout the state caused the river to rise above Yarra Street and the locals had to wade across the river at the football ground to get to the township. “I was only a couple of months old at the time,” Chris said. “So I have no memory of the flood, but I remember well the Black Friday bushfires of 1939. “My mum Phyllis, sister Robin and I were sitting in the river opposite the cliffs when the fire roared across the top of us as we huddled under wet blankets. I wasn’t scared and thought it was exciting. I was only five at the time. Chris was born into one of Warrandyte’s oldest families and can trace her ancestry back to the gold rush days of 1853, when her great-great Uncle John Hutchinson arrived here. John held the position of pound keeper from 1855 until 1872. Her great-great grandfather William Hutchinson arrived in 1855 and eventually owned all the land from the top of Melbourne Hill down to the tunnel. Her father Richard Spetts married Phyllis Hutchinson and they both worked in the local butcher shop. They set up their home and started to raise their family in Castle Road. “It was great living near the river and us kids spent all summer swimming there, but we had to scurry home for tea when we heard our father’s whistle,” Chris said with a smile. When Chris was eight years old, her parents split up and both she and her sister were sent to live in a boarding school in Killara. Two years later their dad came and rescued the girls from Killara and took them to live with him and their grandmother in Croydon. “They were good years and dad tutored me in mathematics and algebra. After his tutoring I received top marks,” she said with pride. Eventually Chris and Robin returned to live in Warrandyte when their father took them back to the family home in Castle Road. “I loved being back in Warrandyte and it felt like I had come home,” said Chris. “We were much more independent and free living here. I loved it so much that after I married, I imported my husband Jack to Warrandyte. Chris remembers walking to Warrandyte Primary School in the mornings. “I mostly enjoyed school but wasn’t too happy when one of the teachers picked me up by the fringe of my hair,” she said. “At school during WWII we used to train in case of air raid attack. The boys dug trenches and we had to crouch in the trenches with our erasers clamped between our teeth. The teachers made us do that in case a bomb went off and we damaged our teeth. Chris was 17 when she met her husband Jack (then 22) for the first time outside the Melbourne Town Hall. They were friendly at a party three months later and married within two and a half years at the historic Christ Church in South Yarra. After that the couple bought a house in Houghton’s Road. They started a family of four children. Michael now is 61, Susan 59, Linda 58 and Macgregor 54. Next March, Chris and Jack will have been married for 62 years. The couple has four grandchildren and seven great grandchildren and keep busy tending their garden in Knees Road. But life is not all roses and about five years ago the Scotts were given a new challenge. “Jack was diagnosed with Alzheimer’s disease and that has slowed him up a bit,” said Chris. Recently she was asked to share her experience with Alzheimer’s by being a guest speaker with Alzheimer’s Australia. “I’m not used to making speeches but I think I did OK,” she said. Jack immediately smiles and offers his heartfelt support. MOTHER and son duo Nicole and Joel have seized a window of opportunity in the business world through their new entrepreneurial initiative, Crikey Crickets. The pair teamed up to breed and sell live crickets from their home in Warrandyte to local reptile owners. The idea stemmed from Nicole’s light-bulb moment when she was fed up with spending excessive amounts on crickets to feed Joel’s five hungry bearded dragon lizards: Jupiter, Rocky, Regis, Hamish and Charlie. 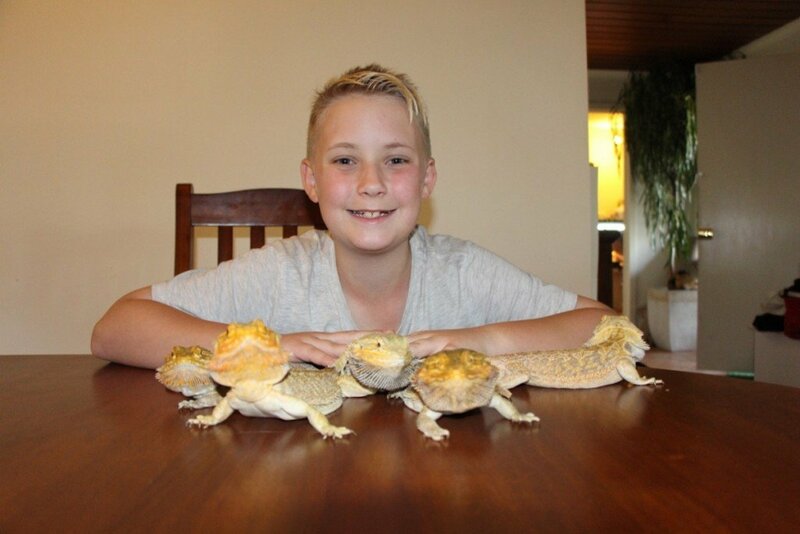 It was costing the family about $36 every 10 days to keep the lizards healthy and satisfied. With that, Nicole suggested to Joel they go into business to breed and sell crickets themselves. Although initially apprehensive towards his mum’s ambitious venture, Joel was quick to jump on board. Anderson’s Creek Primary School allowed Joel to survey the school in order to gauge the level of interest in their endeavour. He then proceeded to design and hand out fliers to local reptile owners, offering a cheaper alternative to the leading cricket vendor. Many instructional YouTube videos later, Nicole and Joel came to realise that the process of breeding the critters would not be easy. “It takes around 8-12 weeks for them to fully grow and there’s a lot of death with the babies,” Joel explained. Eventually the pair came to perfect the science and business began to boom. Joel also handles the marketing side of things and designs the buckets for delivery. “I have around eight or so customers at the moment all wanting crickets every now and again. And I just got my school to purchase crickets from me for the Animals Program. I’ve got a few kids from there getting crickets and then a few mothers from ACPS,” Joel said. When asked how he goes about getting the product to his customers, Joel told the Diary he sometimes does the deliveries himself. Joel advises other like-minded, entrepreneurial young people to “just research what you want to do and pursue it”. For his next ambitious venture, Joel intends to establish his own part-time dog grooming business. Joel told the Diary the teachers at Templestowe College are very supportive of his goals through the Animals Program. “I want to be a part-time dog owner when I’m older. I’m already going to groom two dogs tomorrow at school,” Joel said.